Double IPAs have a lot more of what hop lovers want - both hops and malt. Left Hand Brewing Company promises that they didn't skimp on either in their special limited edition of Left Hand Twin Sisters Double IPA. They claim to have a literal hop farm with twice the amount of hops and twice the malts of normal IPAs. Twin Sisters Double IPA has a 9.6% ABV rating and 77 IBUs put into this 22oz bomber bottle. Left Hand used Cascade, Willamette and Glacier hops along with CTZ hop extract (Columbus/Tomahawk/Zeus). Their grain bill includes not only two-row and Munich malt, but also Rye, flaked barley and crystal rye. I recall trying this beer about 4 years ago during a trip to their tasting room in Longmont, Colorado. 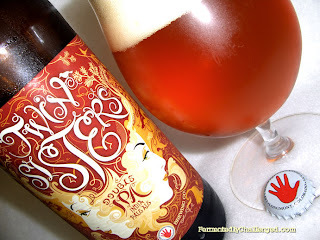 Back then, I was amazed at how hoppy, yet sweet and dry and powerful this beer was. I was anxious to try this again and give it a full review this time. Appearance: This double IPA was poured cold fresh out of the cooler. It filled the glass with a golden bronze color and a big bright nearly white head that lasted for quite a while. I ensured that I had a nice clean glass and the head retention and lacing on this beer was outstanding. The beer itself had good clarity. I couldn't see any sediment in the glass or in the bottle. The beer appeared to have an adequate level of carbonation too. Aroma: Twin Sisters started out a bit different than other recent Double IPAs I've had. Granted, there was a big upfront presence of citrus and earthy hops, but the pine characteristics were a bit and instead had some woody tones. The malts wanted to play up front as well. The addition of rye malts to this brew brought out a bit of sweetness and spice. I could tell that this beer didn't want to be just all about the hops. Sure, they were definitely there, but I felt that Left Hand wanted to highlight the malt characteristics and a touch of sweetness to balance out the big hop profile. The Willamette (pepper, fruit, floral) and Glacier hops (citrus, herbs and woody) gave the hop profile a different turn than those with predominantly Cascade hops. Taste: There was a lot going on with the taste of this beer. Twin Sisters started out bitter, gave way to a sweet malt characteristic, and then finished clean with a drying effect. This beer had a medium to full body and the flavors clung to the inside of my mouth and stayed for several moments after the sip was done. I could pick up some citrus flavor, some sweet and dry rye malt taste and perhaps a hint of lemongrass as well. Seeing how this beer was nearly 10% ABV, I could pick up on some alcohol characteristics with a bit of heat after 4 to 5 sips. Neither the hops nor the malt seemed to outclass the other. Left Hand balanced this beer very well. 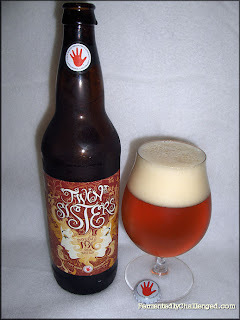 Overall: From all of the different hoppy beers I've tried at Left Hand, Twin Sisters seemed to be one of the more outstanding beers. It's powerful and commands some respect. It's a slower drinking beer because of it. I liked how it seemed totally 180 degrees different from the last Double IPA I tried (Stone Enjoy By 04.20.13 IPA) in that it featured more of the hops and had a tasty rye component. I really love what Rye does for an IPA. I recommend letting this beer breathe a bit before enjoying. As the beer warmed it really brought out all of its flavors and subtleties. Don't let the beer warm up too much, however, as it can lose a bit of its crispness. Admittedly, I was completely satisfied with just one 12oz pour. Finishing the entire 22oz bottle definitely left an effect on me - so enjoy with care. The blend of hops seemed unique and slightly unexpected. The Rye malts along with the Two-row added a nice layer of complexity. Overall, a very quality brew. I would definitely drink this again and recommend it to IPA lovers. Disclosure: This beer was sent to me directly from Left Hand Brewing Company as a promotional sample. I was not paid for this review, but I stated that I would post an honest review of the beer.